We sent the following survey to the addresses listed with the Chicago Board of Elections for all candidates for all 50 aldermanic races as well as all Mayoral candidates. Below the survey you will see a summary of the results and then links to the actual surveys that were returned. We are also including in our summary below the responses from all five mayoral candidates to questions regarding mental health services asked by Access Living. The Mental Health Movement does not endorse candidates, we are providing this information for public education and in the interest of increasing the visibility of pressing mental health policy issues during the elections and beyond. Mental health and wellness are important healthcare concerns for all Chicago citizens and their families. The Mental Health Movement was founded to fight for public mental health services and to ensure that free and accessible mental healthcare is made available to all. Three of the six mental health clinics have no full-time psychiatrist or no psychiatrist at all. City mental health clinics do not accept Medicaid managed care plans for insurance. Consumers of mental health services are going without medication, placing them at risk for psychiatric relapse because the clinics are understaffed. Please take the time to fill out the enclosed survey to share your views on public mental health services with our organization so that we can be better informed about your platform for office. We appreciate your support for public mental health services in Chicago. 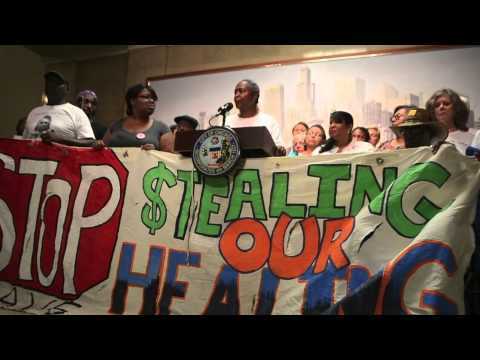 1) In 2012, the Chicago Department of Public Health closed 6 of its 12 clinics resulting in disruption of care for clients and a reduction in services to Chicago residents, especially in low income, underserved communities. Research indicates that there is a significant unmet need for mental health services throughout the city. • Would you support an addition of $2.71 million to the CDPH budget each year over four years to open (or reopen) two mental health clinics each year? 2) For many years CDPH has not conducted any educational effort to increase public awareness about the importance of seeking mental health services and about the availability of city mental health services. • Would you support efforts to require CDPH to conduct a public education campaign with an initial focus on communities near the current six clinics? 3) CDPH argued that it closed mental health clinics due to budget constraints but it has repeatedly failed to pursue revenue-generating options for the mental health centers. In fact, management problems with billing the state for services have resulted in a loss in revenue numerous times. • Would you support efforts to ensure an open admissions policy at all CDPH mental health clinics to bring in much-needed revenue and expand options for those seeking services? • Would you support efforts to ensure adequate billing procedures at CDPH? Click on individual candidate names for access to actual survey. The results in this table represent the Mental Health Movement's summary of candidate responses as submitted to us. For the three mayoral candidates who did not respond to our survey (Rahm Emanuel, Bob Fioretti and Willie Wilson), we included in the table the answer they gave to Access Living when asked if they would re-open the 6 mental health clinics the city closed in 2012. Columns are questions asked of candidates. Click on Candidate names to see copy of actual survey responses. Did not respond to Mental Health Movement survey. On Access Living Survey did not answer with yes or no to question about re-opening the 6 mental health clinics that he closed. Did not respond to Mental Health Movement survey. On Access Living Survey said yes to question about re-opening the 6 closed city mental health clinics. Public Safety; reopen public schools and fund; funding mh clinics. We need to look and act for the long term and not the short term. City services for the 2nd Ward: zoning, public safety, health & social svcs, schools, streets & san, economic development. Yes. MH care is an import. to health. Encouraging resid. to seek help could prevent tragedies save the city $$. Yes. I opposed closing clinics. Our neighbors relied on the clinics, closing clinics was akin to throwing them to the curb. Economic dev: jobs, businesses, etc. ; Social stabilization: housing, schools; Safety/Security: comprehensive partnerships w/: block clubs, police, community groups, schools; Quality of Life: upgrade ward public parks, beach, etc. Yes. We also need to examine the millions wasted on mgmt; priv. contracts, etc. Improve: Public education; public community services; how money is allocated to special interest groups and corporations. Yes, this should not be forced is should be done because it is the right thing to do. Improve quality of life through: dev. Roseland Med District; Red line extension to altgeld, transit dev. Develop community resources, establish ward night, public safety, etc. Yes. Join w/ business, community & religious groups to support mh educa. Yes. City life is stressful & urban poverty is the most stressful of all. Yes. The alleged savings was a drop in the bucket compared to the public money given to private dev. Redistribute money from downtown tourism to neighborhoods & services for residents: community based health facilities, schools, local bus. Yes. Our city suffers from a lack of humanity in budget – this should not be a Benefit problem it is a priority on funding problem. Safety, economic development improving CPS schools, improving affordable housing & providing excellent constituent services. Improve schools with more wrap-around services, go after problem building owners, business development to fill store fronts, better service in ward office, re-open one of mental health clinics in ward.